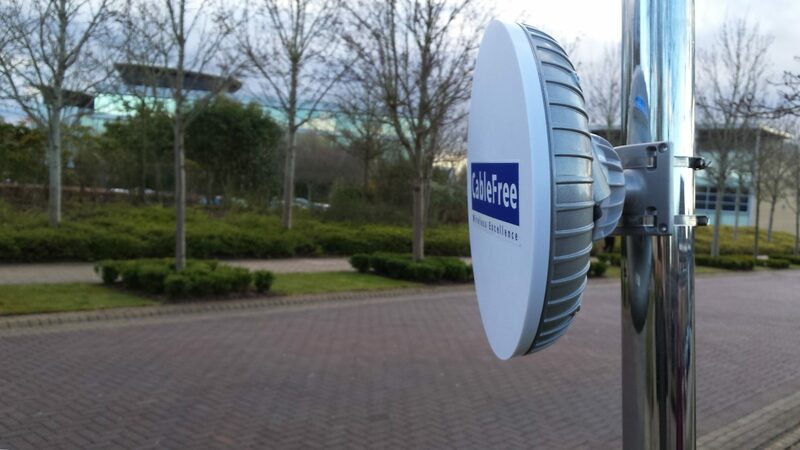 CableFree: Wireless Excellence has pioneered reliable, carrier-class Free Space Optics (Optical Wireless) equipment, with thousands of commercial deployments in diverse markets since 1997. Our CableFree range of FSO products include advanced features such as ATPC to overcome high fade in adverse conditions, Industry-leading link margins for reliable performance at long range, and proven stable beam optical design. CableFree FSO products reflect a deep understanding of the challenges of FSO transmission and ensure best-in-class performance and availability. These features combine together to ensure ease of installation and high-availability networking in all conditions. Free Space Optics (FSO) is a technology that uses laser beams via a line of sight optical bandwidth connection to transfer data, video or voice communications across areas ranging typically from 100m to a few kilometres at throughput bandwidths up to 1.5Gbps at frequencies above 300GHz of wavelengths, typically, 785 to 1550nm. Using Free Space Optics wireless networks eliminates the need to secure licensing found with RF signal solutions and also the expensive costs of laying fibre optic cable; principally the concept of transferring data via light is the same as with fibre optics just through a different medium. The basis of Free Space Optics communication is rather straightforward with a pair of transceiver units housing an optical receiver and transmitter, allowing the sending and receiving of data simultaneously, and an optical source with a focusing lens. The unit at one location transmits a beam of focused light carrying the information directly at the unit at the receiving location where the light beam is then transferred to an optical fibre from a high sensitivity receiver. Service Provider backhaul to carry large amounts of data between the client network areas and the core network. Free Space Optics provides speeds comparable to those of optical fibre connections with the flexibility and practicality of being part of a wireless network providing bandwidth speeds typically advertised as up to 10Mbps, 100Mbps, 155Mbps and 1.5Gbps, with possible speeds of up to 10Gbps becoming likely in the future, plus the potential of being able to use WDM (Wavelength-Division Multiplexing) technology. Currently, the only other wireless technology capable of these kinds of speeds is Millimeter-Wave RF Wireless Networking which, in comparison, requires licensing and can affected severely by rain. Due to the received beam being transferred onto an optical fibre to connect to the core network, trouble free integration and easy set up make Free Space Optics networking’s compatibility with any system very high. FSO is generally deployed well above ground – typically in rooftop locations. This is the opposite for fibre / fibre optic cable, which is typically installed under road or street level. Therefore very different challenges are presented when considering Free Space Optics performance with the biggest being atmospheric conditions. However, most drawbacks and shortcomings can be resolved through the inclusion of redundancy systems and correct wireless network planning. Unlike rain and snow, – which generally has little effect on Free Space Optics communication -fog and water vapour droplets are a real hindrance to the operating performance. The small water droplets can at points completely stop the light beams from being received due to light absorption, refraction scattering or even complete reflection which can significantly lower data rates. Therefore in foggy areas, Free Space Optics may not be the best solution, however applications have been successfully carried out that have provided acceptable reliability with redundancy systems in place. The following five points listed all refer to the signal attenuation caused by atmospheric conditions. CableFree has pioneered Automatic Transmit Power Control (ATPC) to automatically increase transmit power and link budget during “fade” conditions which radically increases the link performance and availability. Water vapour molecules in the air absorb the energy from photons (light particles) within the light beam which causes an overall loss in power density. The use of spatial diversity and correct system power helps combat this effect as absorption is more common at certain wavelength ranges of light. Fluctuations in signal strength can be caused by variations in temperature of air pockets between the transmitter and receiver due to natural differences or objects such as buildings etc. This effect, know as refractive turbulence, causes image dancing or blurring of the signal at the receiver end which results in amplitude loss. Beam wander or jitter is the amount that the centroid or peak value of the beam strength profile moves with time and can be caused by turbulence resulting in the beam becoming unfocused. Scattering occurs when certain wavelengths experience collisions with objects and are redistributed in varying directions without energy loss (unlike absorption). Scattering is more likely to have a more frequent and larger effect over long distances where it can have a significant effect on beam strength. Beam spread, or more technically called beam divergence, is measurable angular effect of the beam’s dissipation at a constant rate as it travels further through the atmosphere. Due to light not be able to travel through opaque mediums, objects such as birds, planes and people can momentarily cause interruptions to the service by blocking the Free Space Optics’ light beam, with service resuming instantly when the light path is cleared. Multi-beam technology can be used with compatible systems to try and counter this problem. Building sway due to wind can be a problem as it disrupts the alignment between the two transceiver units causing loss of signal. Divergent beam technology can be used to allow the units to communicate in these situations but performance is still slightly affected. All Free Space Optics technology is strictly controlled to make sure that standards are followed to limit any dangers. All CableFree FSO systems are certified to be Class 1M, which is safe to the naked eye. Our Free Space Optics units are of low enough power not to cause long term harm when the laser is exposed to a person’s eye, however as with all optical emitters of all types, precautions should be taken so that prolonged exposure never occurs if possible.